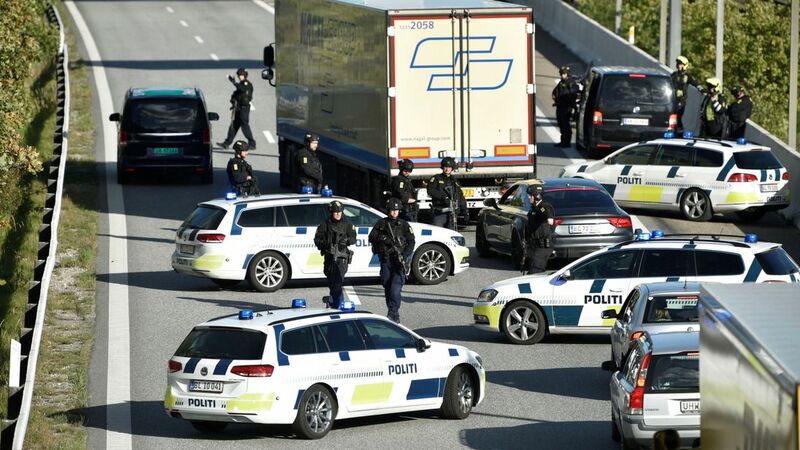 Denmark's eastern island of Zealand, where Copenhagen sits, was cut off for hours as soldiers and police launched a massive manhunt. The Oresund Bridge, which connects Denmark with Sweden, was closed in both directions at around 1pm UK time. The Great Baelt Bridge between the Danish islands of Sjaelland and Fyn was also closed and ferry crossings to Germany and Sweden were cancelled. At about 3.20pm UK time, police said all bridges and ferry crossings were being re-opened, sending thousands of travellers on their way again. 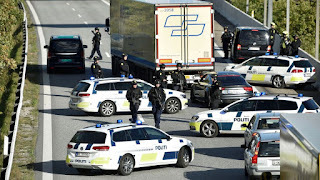 A police helicopter and dog squads were spotted on a highway near Roskilde, 40 miles west of the capital Copenhagen, according to Denmark's TV2. Police issued an appeal for sightings of a black Swedish-registered Volvo car, saying there were likely to be three people inside involved in "serious crime". The people inside the car should not be approached, they added in a statement. Sweden's Aftonbladet newspaper quoted an unnamed police source as saying the car was being sought in connection with a kidnapping.